This is the third post in a series of writings to discuss issues facing Information Technology (IT) departments. The first challenge was project work vs production support and the second challenge was prioritizing work. IT shops vary in size, budget, and processes. But all IT shops share a common set of challenges that shape how they interact with their inter-company customer base as well as the clients of their organization. There isn’t a single answer to these common challenges and they don’t disappear after a process is put in place to address them. The manner in which IT management chooses to respond to the challenges is interwoven in the culture, processes, and services of the group. My thoughts are more around framing the problem than presenting solutions. 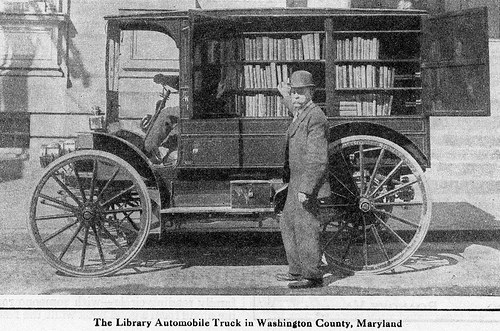 1916 Library Truck – Innovation or operations? The third challenge is based on the fundamental service expectations from management and stakeholders of the Information Technology group. Some business stakeholders primarily rely on IT to keep technology equipment operating efficiently and with high availability. I call this the operations expectation of IT. The business owner is concerned about delivering some service or product for the business, not about all the details of the equipment that make it possible. I like to think of this as the invisible part of IT. If everything is working then stakeholders don’t know the group exists. But if something is wrong then everyone knows it and IT is on point to fix it. The operations side of IT is expected to reduce or eliminate costs in the business. But some stakeholders in the business are expected to grow the business through sales and market share. For that they often need innovative solutions. They want the IT development department to be innovative and provide new solutions that offer competitive advantages or competitive differentiators. That’s a completely different mindset and skill set from the operations teams within IT. The innovation teams are expected to grow revenue for the business. Allocating resources within IT to support these two thoughts is a challenge because most IT shops don’t have the luxury to have dedicated personnel for each function. Even within IT development, programmers are pulled between production bug fixes (operations), new functionality, or even completely new technology platforms. This challenge is similar to the first challenge of production support vs project work. The key difference is that the innovation expectation often takes IT into new areas where they have not previously provided service. Innovation requires IT to think about new ways of doing things rather than solving a request with existing tools. The IT development group has a backlog of helpdesk tickets reporting software defects and another backlog of defects discovered during QA testing. A new project request is entered by the marketing department to create a new application and is expected to grow revenue by some forecasted amount. Do the production defects or the new request receive priority? The IT team is three days from launching a new service for a client. The data center takes a lightning hit during a thunderstorm and several pieces of equipment are lost. Replacing the equipment will take team personnel away from the project and jeopardize a schedule overrun. The immediate challenge is allocating people across operational work and new innovation. But I believe the challenge goes deeper. An operations skill set and mindset are different than an innovation mindset. Innovative individuals work with shades of grey and unknowns whereas operations individuals operate with black and whites and certainties. Innovation is open to explore. Operations minimizes risk through tight controls.